Often when Im out cycling in Suffolk I come across a village and I think, yes, this is nice, this is a place where Id really like to live. But Stonham Aspal is not one of them. For a cyclist, the A1120 which threads though it is a hellish route, a rat run across the middle of East Suffolk. It was designated a 'tourist route' in the 1990s when brown signage was first introduced to the UK, but you can't turn a country road into a tourist route which bypasses Ipswich without expecting the great majority of through drivers to use it. It cuts from the A12 to the A14, from Stowmarket to Yoxford. The local authority hoped to attract tourists to Stonham Barns, Framlingham and what was then a vineyard at Bruisyard, but local drivers saw it as an opportunity. It was a big mistake, and the signs on the A14 that tell you not to go down it if you want to get to Yoxford fool nobody. Everybody knows that it will cut a good 20 minutes off the journey, and it is villages like Stonham Aspal that pay the considerable price. But the village pub, the Ten Bells, is a decent one, and its very appropriate name tells you what is significant about the building across the road which we have come to see. Two things strike you immediately about St Mary and St Lambert. Firstly, theres the name. It would be foolish to make too much of the dedications of Anglican churches, since few of them have remained unchanged over the centuries. Indeed, during the years between the 16th century Reformation and the 19th century sacramental revival they largely fell into disuse, and some curious current dedications are, in fact, the results of the work of well-meaning but inaccurate 18th century antiquarians. For example, several dedications in what was the Norwich Diocese were conflated or confused; Chattisham took on Shottishams; Kirton took on Shotley Kirktons. Antiquarians confused the Suffolk Hoo with the Norfolk Hoe, and thought that Suffolk's Shimpling and Norfolk's Shimpling were the same place. Great Ashfield and Badwell Ash actually swapped dedications. The enthusiasm of 19th century Rectors should also not be underestimated. At Whepstead, the parish church is dedicated to St Petronilla, uniquely in all England; but this has no basis in antiquity. Rather, someone in the 1890s had a special devotion to the Saint, or perhaps thought it was simply a nice name. So youll not be surprised to learn that the Saint Lambert here is a mistake. In fact, there are three Stonhams, and this one once used the name of the Lambert family, owners of the Manor, to distinguish itself from the others. Such distinctions are rather more common in Essex. There is such a thing as a Saint Lambert, but this isn't him. Secondly, of course, there is that tower. it is remarkable because it dates back to the 18th century (although what you see now is a rebuilding of the early 1990s). It gives the bells a quite different sound to that of them being rung in a tower of brick, stone or flint. As at Haughley, the tower appears to be a quite separate structure, as if it is only joined on incidentally to the body of the church. In many ways, this is an unusual building, and it repays the effort of walking around it. The clerestory is gorgeous, although rather lost beyond the collision of aisle and tower. Bell chambers like the one here arise from a historical accident. After the Reformation, the adoption of Cranmers prayer book made bells liturgically redundant. Their only remaining uses were secular. Any number of things could have happened as a result of this, and most of them did. In some parishes, the bells, and by default the tower, fell into disuse. The weak materials from which the towers were originally constructed, coupled with puritan suspicion of ornate decorations of ecclesiastical buildings (the puritans were strong in Suffolk) meant that towers fell throughout the 17th and 18th centuries. By the 19th century there was a concern for their welfare, and an interest in liturgy, which conspired to encourage many parishes to effect repairs. But not all, and they continued to fall, often neglected by otherwise grand 19th century restorations. Acton was taken down as unsafe in 1880; Stanton All Saints collapsed in 1906. Bildeston collapsed as recently as 1975, the scaffolding for its impending restoration splintering like matchsticks in the rubble. There were reasons, however, for towers to be cared for after the Reformation, and before the Victorians came along. In Suffolk, and especially along the coast, many were watchtowers  you can see far out to sea from the top of the churches at Southwold, Kessingland and Wrentham. Other church towers were used as strongholds. But there was another factor. 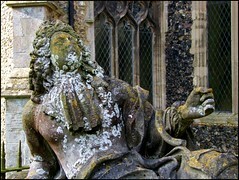 There were few artistic flowerings in the English church in the 17th and 18th centuries. The Renaissance bypassed these islands, pretty much. It is therefore some recompense that the English invented recreational bell-ringing. As well as their sacramental use within the liturgy, bells had probably always been used for ceremonial and processional purposes. In the later Middle Ages, they replaced Mass dials almost everywhere as a way of informing the people when Mass was about to start. We know they were rung on Holy Days, and tolled for the dead. When these purposes fell into disuse (ringing for services, ceremonial ringing and tolling for the dead are probably Victorian reinventions; the last of these never survived the great silence of WWII) all that was left was ringing for secular purposes  to warn of an invasion, perhaps, or to call the people together. Some churches had a clock bell (Hadleighs sanctus bell was adapted for this purpose), but a clock bell is not actually rung, it is struck. These uses alone were not enough to sustain the upkeep of towers everywhere in such troubled and impoverished times. So it was a great salvation that a new use was found for the bells. This was not possible in churches with only one or two bells, which is the case of most Suffolk churches, but where there were more, they could be used to splendid effect. At Horham, for instance, which has the oldest ring of eight bells in the world. And here at Stonham Aspal; Mortlock tells us of the local squire, Theodore Eccleston, who was an enthusiastic bell-ringer. In 1742, he replaced the ring of five bells with one of ten, and the bell chamber was built to house them. I'm not clear if the tower was partly demolished to accommodate them, or if it had already fallen prey to the depredations of the two centuries since the Reformation. Bell-ringing is as much maths as physical exertion, a pursuit that takes a minute to learn and a lifetime to master. A bell team ringing together enters an inner communion, an almost trance-like state where all individuals are subsumed to the greater purpose. Bell-ringing continues to be important in Suffolk, as it has been for centuries now. In Ronald Blythes majestic Akenfield, we meet the bell teams ringing in Suffolk between the wars, walking in a group from one church to its neighbour to ring for the next service. On summer evenings, a walk might take them to ring at half a dozen churches. They undertook feats of endurance on special occasions, extravagant displays of ringing sequences with beautiful names. They were an independently-minded people, often not the least bit religious. This is still the case today. 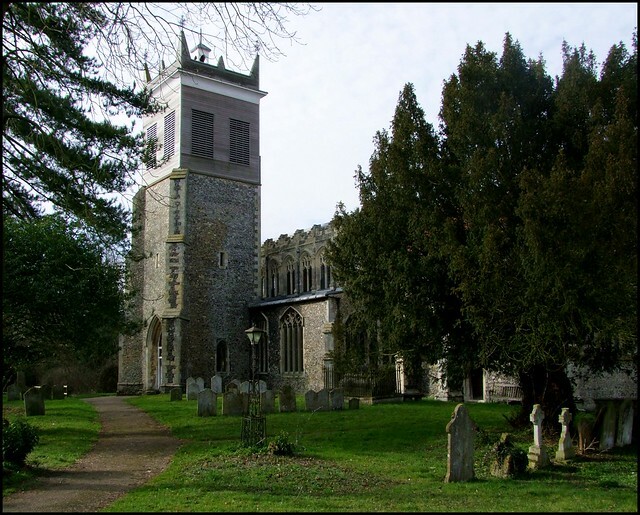 Ringing ran in families in Suffolk; the Baileys, the Wightmans, the Chenerys, the Pipes. It still does. Well, as romantic as this all no doubt is, Im afraid that, if you had come with me to St Mary and St Lambert in the spring of 2003, you would have been rather shocked by the state it was in. What at first appears to be scene-of-the-crime tape at the west end was actually protecting me from falling masonry. Several of the windows need repairing or replacing. Back in those days, the church was kept locked, which I thought inexcusable in such a busy village. As the major church insurance company patiently explains again and again, a locked church is twice as likely to be vandalised as one that is unlocked. A church that is kept locked is far more likely to be broken into than one that is opened regularly. And, get this - a locked church is even slightly more likely to have something stolen from it than an unlocked one. However, those times are past, and coming back to Stonham Aspal in 2011 I already knew that much work had been undertaken here, and that I would find it open. I arrived and had a good look at Francis Bird's leisured memorial to Anthony Wingfield, which Pevsner memorably described as looking like it is taking a country holiday from Westminster Abbey. I stepped into what is essentially a fairly anonymous and urbanised Victorian restoration, the work of that low-brow architect Edward Hakewill, which probably caused more damage than Dowsing's visit of 1644. Hakewill was a great one for adding dark and gloomy north aisles, but fortunately for us this church already had a north aisle, and the building is full of light. There is very little coloured glass, and although the west window is incongrously small, the clerestory does its work for it. Intriguingly, the two easternmost clerestory windows have fragments of medieval glass in the upper lights, presumably reset by Hakewill from elsewhere in the church. There are more medieval fragments in the aisle windows. The light allows a full inspection of a characterful set of bench ends. Mortlock describes them as extensively and cleverly restored, although I don't think there is much here that is medieval. A wolf guards St Edmund's head, a pious lady kneels at a prayer desk, a rather incongruous Chinese dragon shows off his beard. Some 17th century bench ends survive in the north aisle, their solid, slightly rugged appearance typical of the period. There is a good early 17th Century brass to John Metcalfe, who was minister here for more than half the Elizabethan period. The weeping children on an earlier brass have been polished to within an inch of their lives, but this somehow makes them even more haunting. The oldest thing here is the curious 13th century font, its arcading seeming most un-East Anglian. Did it come from here originally? Another curiosity is the vast bound chest in the vestry, which the churchwarden showed me - it is so big, indeed, that the vestry must have been built around it. And the vestry has another curiosity, because if you step outside you can see that the entrance is flanked immediately to east and west by the headstone and footstone of the same person's grave. The story goes that the relatives of the deceased refused to allow him to be moved so that the vestry could be built. The single-minded Rector dealt with this by having the vestry built anyway, and its entrance placed directly over the unfortunate deceased's grave, dividing the headstone from the footstone. Thinking about it afterwards, I realised that they were probably simply reset either side in a decorative manner. But it is a good story.